Mother’s Day is tomorrow and while I love the holiday it has never been something my husband puts a lot of thought into. Every couple of years my son and I share the day as he was born on Mother's Day. This Mother's Day I will be thinking about a mom in town who buried her son yesterday. I don't know her but I know him and many members of his family. Based on how I am feeling at this tragic loss I can only imagine what she is going through. 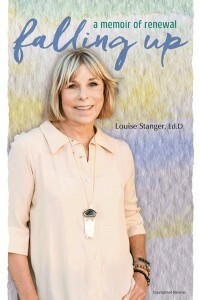 For her and many moms this holiday isn't an easy one which is why I want to mention a new book called Falling Up: A Memoir of Renewal by Dr. Louise Stanger – a clinical social worker, professor, author, and intervention specialist for more than 30 years – has personal and professional experience on being a single mother, widow, and losing a child. Her husband died suddenly when she was in her forties, leaving her alone to parent her three daughters. This came after her son passed away from SIDS – an excruciating loss. Nevertheless, she persevered through these incredible hardships and went on to make her life’s work about helping others. Her remarkable story highlights her motivational message of renewal and transformation, which she shares with the world in her new book FALLING UP: A Memoir of Renewal. She provides inspiring insights and lessons that prove that no matter the odds, you can not only survive, but thrive.